What's Wrong With A Hunger Games Movie? At first blush, a movie version of Suzanne Collins' media-saturated death-sport novel, The Hunger Games, sounds like a great idea. Until you realize the major pitfall that movie faces, that is. According to the Hollywood Reporter, Lionsgate picked up distribution rights to the Hunger Games movie, which will be produced by Nina Jacobsen and her Color Force production company. Collins, a former television writer, crafted a thrilling, twisted world where the chosen victims from across a fractured United States have to fight for their lives - while playing to the cameras and trying to win sponsorship deals. (Those sponsorship deals are pretty much the only way to get crucial supplies during those Running Man-esque fights.) 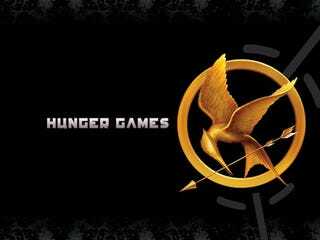 The novel's main character, Katniss, is a rough-edged forest hunter, but she learns to pretend to a whole range of emotions, including love for her fellow gladiator Peeta, to win over the audience's sympathies. We loved The Hunger Games when it came out last fall. And as I said, a movie version of the book sounds like a great idea at first - you can foreground the crazy media hype and oversaturated coverage of the Games, and show how Katniss gets sucked into becoming a packaged commodity even as she's fighting for her life. It could even be a bit Ed Neumeier-esque in its social satire. But the more I think about it, the more it seems like a Hunger Games movie will inevitably miss the point. First of all, you won't be able to get inside Katniss' head and see how every time she shows emotion, she's inwardly calculating exactly what to show, in order to win over the viewers. (And after a while, she can't even tell what she's really feeling, because she's so busy putting on a performance.) On the movie screen, we'll be as taken in by her performance as those viewers, without any of the undercurrent. Also, instead of simply seeing the Games from Katniss' point of view - with her aware of the cameras watching her all the time but not knowing how she comes across on camera - the movie will probably give in to the temptation to intercut between Katniss' experience, and how it looks to those outside viewers. Most likely, we'll see some of the events from the point of view of Haymitch, the drunken lout who won the Games before and is now Katniss' main advisor. Obviously, I know that movies and books are different creatures, and what works in one medium seldom works in another. And usually, I'm the last person to worry about a movie's faithfulness to the book - I'd way rather have a movie that works well as a movie, on its own terms. But this time around, I can't help feeling that the heart of the story will be jettisoned in the transition, and what remains will be barbaric and superficial - the very essence of the world the novel subverts so elegantly. Let's hope I'm wrong.